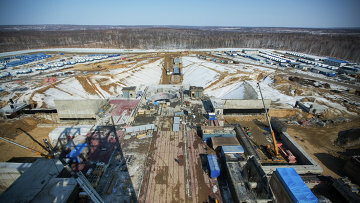 Moscow court refuses to release defendant in Vostochy Cosmodrome embezzlement case | Russian Legal Information Agency (RAPSI). MOSCOW, October 9 (RAPSI) – The Moscow City Court has refused to release the former CEO of Volga-Vyatka construction company (VVCC) Yevgeniya Degtyareva sentenced to 4.5 years in a penal colony for embezzling 1.3 billion rubles ($19.8 million) during the Vostochny Cosmodrome construction, RAPSI correspondent reports from the courtroom. The court refused to recalculate duration of Degtyareva’s sentence in accordance with recent amendments to Russian legislation fixing certain changes in the rules governing the set-off of time spent in detention with respect to the calculation of prison terms. The court also denied recalculation of sentences for other defendants in the case. On February 21, the Simonovsky District Court of Moscow sentenced Degtyareva to 4.5 years in prison; her father Sergey Degtyarev, who is believed to be the real owner of the company, received an 8-year prison term; ex-VVCC managers Alexander Bazankov and Murat Matuyev were given 6 and 5.5 years in prison respectively. Additionally, Degtyareva, Bazankov and Matuyev were fined 1 million rubles (about $15,200) each, and Sergey Degtyarev was fined 1.5 million rubles (about $22,900). 17:05 09/10/2018 The Moscow City Court has refused to release the former CEO of Volga-Vyatka construction company (VVCC) Yevgeniya Degtyareva sentenced to 4.5 years in a penal colony for embezzling 1.3 billion rubles ($19.8 million) during the Vostochny Cosmodrome construction.